Start parameters can be defined when creating or editing an SSO application. These parameters are immediately transferred when starting the application. This is done, for example, to directly start the program with various basic settings. The corresponding parameters should be requested from the manufacturer of the software or taken from the documentation. The parameters can be directly entered in the application in the corresponding field. Alternatively, a configuration window is also available for this purpose. The required elements can be moved here from the right side to the left side by drag & drop. 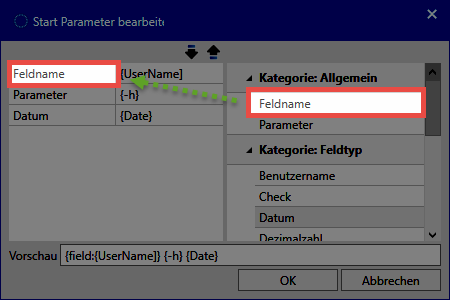 In the Parameter category, only the parameter descriptions Field name or Parameter are available. These then need to be manually supplemented. The parameters in the Field name category can directly address the fields, meaning directly transfer the field names. For both parameters, the password fields with the names “Left Path” and “Right Path” are then transferred in each case. Fields can be added via certain placeholders based on their type or their name. The easiest way to do this is using the configuration window described above.